You and your BFF can dress up your fashion style by picking out dresses and finding the right makeup to match! Design a card for your BFF with lots of fashionable stickers for everyone else to see how much fun you’re having and keep it forever! Take pictures with your new best friends! Take a picture with your camera and you can be in the game too and the memories will last forever! Want more fashionable friends? Here are six new best friends! Meet Emily, Bella, Lexi, Madison, Katie, and Lilly, your new BFFs! These six besties can’t wait to include you in their circle of friends forever! 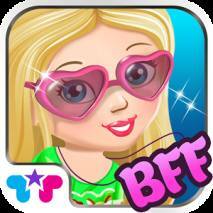 With these fantastic BFFs, pretty makeup, cool style, there’s so much fun to be had!